I'm having one of those days where I feel so sleepy! I worked a long shift today and then afterwards did some thrift shopping. I picked up some amazing Dolce Vita booties that I'll be sharing later this week. 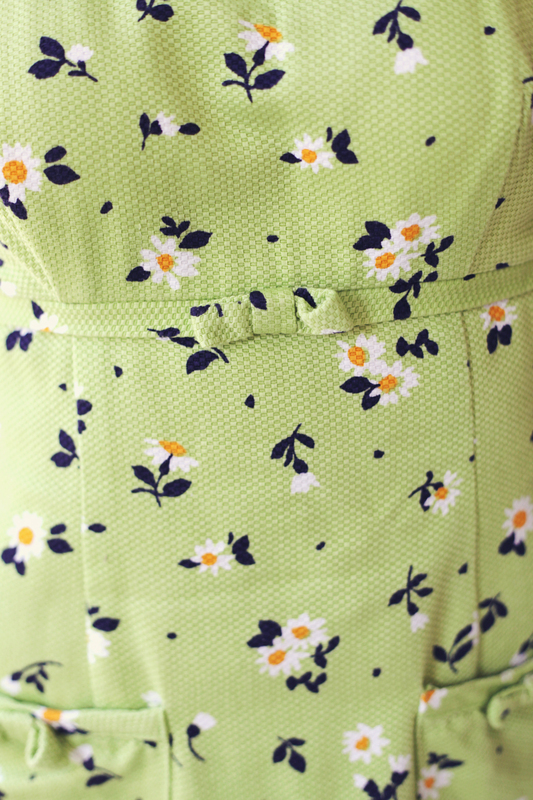 Until then, here's an adorable 60s-inspired dress for you to admire (and buy if you wish!). I am really into the pattern on this dress. Normally I don't swoon over anything lime green, but this has that perfect texture and structure that I love in a garment. It has super cute bow details and (my favorite) pockets! I've mostly just been trying to plan for this weekend's trip to Pennsylvania. I'm pretty much addicted to making lists — I think I get that from my mom. I remember when I was little and we'd go on family vacations. My mom would have everything planned out to a tee! While I certainly don't have an itinerary for our rural trip, I am gearing down and determining what I'll be squeezing into my two Fred Perry weekenders. Sheesh.